Perhaps the most valuable asset an association provides to its members is the educational content shared at a conference. In an effort to make that content more accessible, many organizations post their conference materials online. However, often times the content posted is limited to conference attendees who are looking for papers, presentations and handouts from sessions they already attended. While your current conference attendees certainly appreciate this, this limited approach does little to reach new audiences. By incorporating some simple SEO (search engine optimization) tips into your online conference content strategy, associations can drastically increase the role, value and ROI of your conference. As associations look to increase their relevancy in a world that is changing faster than ever, many are thinking about how to attract and engage younger members. Capitalizing on the younger generation’s tendency to turn to search engines for answers to their most common questions is one logical place to start. In 2012, the Pew Research Center conducted an online survey of middle and high school teachers to understand which tools were most often used for research projects. 94% of respondents indicated that their students were very likely to use Google as their primary source of research. Today, these students are the very same Millennials and Gen Z-ers your organization is looking to attract. They are conditioned to turn to search engines like Google for the information and knowledge your association already provides. Learning how to optimize your online conference content so it shows up at the top of search results will help increase your content’s reach and influence, and ultimately your association’s thought leadership and industry influence. SEO can often be a daunting task for associations who already have limited internal resources. After all, some large companies dedicate entire teams to the discipline. But, according to Casey Emanuel, Search Optimization Manager at Rocket Clicks, a specialized SEO agency and Premier Google Partner based in Milwaukee, WI, most associations would benefit drastically from adding just a few, simple tasks to their annual conference to-do list. Most conference materials—from speaker presentations to handouts—are posted online as PDFs. Emanuel points out that, “just like web pages, you can, and should, optimize PDFs for searchability.” If done correctly, Google will crawl your PDFs for content, and can even display them as organic search results. These steps should only take a few minutes per PDF. To avoid doing all the work yourself, make it a required part of your final submission process. One fairly easy way to build backlinks to your conference content is to encourage your speakers to reference and link to the material within their own online properties. Not only does this boost SEO for your organization, it also helps the speaker increase their own authority and visibility. Oftentimes, the only place you’ll find reference to online conference materials is within the Agenda or Schedule page of the conference website. Emanuel recommends creating follow-up articles or blog posts on popular session topics and incorporating links to the conference materials as part of the article. “These internal links work to build link authority just like backlinks do, helping your PDF files appear in search results for relevant keywords.” To help mitigate additional work, ask your speakers and session leaders to craft the article. They will love the additional exposure, and you’ll have one less post-conference task to complete. Posting your conference materials online does more than just provide increased choice and accessibility for current attendees. 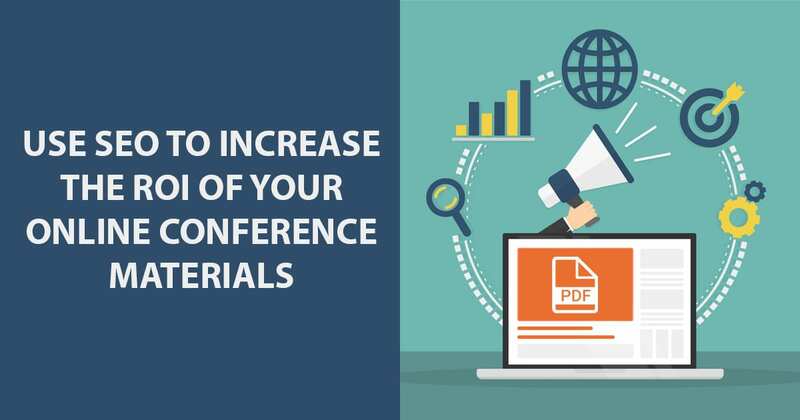 If these materials are search engine optimized, they can deliver valuable answers to new audiences, increasing both the reach and ROI of your conference.